by Dr. Deny Sentosa, Ph.D | Let’s talk about HORMONES! 31 Oct Let’s talk about HORMONES! If one asks you whether you have hormonal imbalance, chances are, you wouldn’t know whether you have it UNTIL someone or something pointed it out (if you do have one). And after you’re caught off-guard, then the discomfort comes (sometimes, ignorance is indeed a bliss). So folks, if you don’t wanna know, stop here! Don’t read further. You’ve been warned. Few other symptoms I noticed are headaches prior to menses, numbing sensation on arms and other body parts, lower back pain during menses. I have imbalanced hormones and that compels me to learn about healthy hormones. I used to have menses every 2-3 months, sometimes longer. In this modern life, artificial coloring, artificial flavors, addictive, and many chemicals are introduced into our system through daily exposures. Have you recently noticed the ingredients in the packet of spices? Or in your shampoo and body wash (paraben, SLS, fragrance – normally synthetic)? Or in your facial products? Recently, I have been noticing and it’s quite scary. Some ingredients are even listed as cancer-causing agent. THESE ingredients create havoc in our body system, especially to those sensitive ones. It’s not easy to avoid these ingredients because once a while, I will be introduced either knowingly (well, sometimes my cravings beat my resolve) or unknowingly (you can’t question the hosts/hostesses about their choice of food or drinks, right?). But I can do something to support my system. Usually, a healthy cycle is 28 days. However, 30-35 days cycle is still normal, you just need to adjust accordingly. Members can access detailed info here. Cramps means body has hard time eliminating excess estrogen. I would suggest you use PPP, and during mens, you can use marjoram, digize or lavender to relieve cramps. 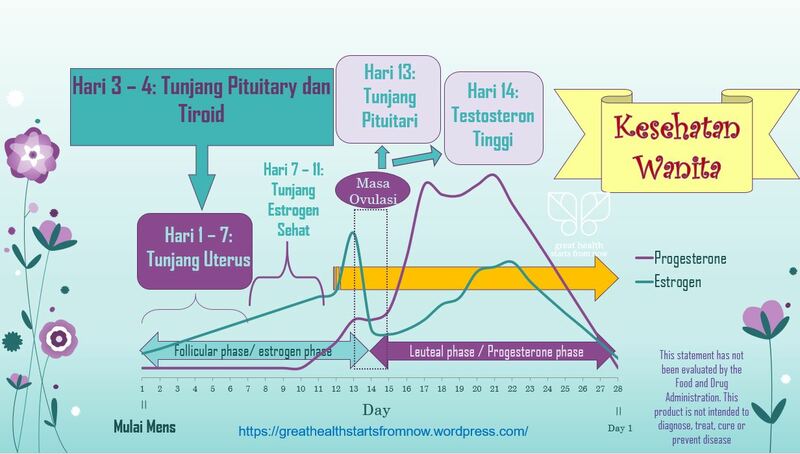 Haloo cik.. Sya menikah thn 2017 bln juli.. Sya sudah promil dan dokter bilang klau sya pcos sel telur kecil2..
Mens saya siklus 30-35.. Bln oktober tgl 29 sya pake ppp pas mens hari pertama sampai skrang.. Bln Ini saya telat 3 hri cik.. Apakah pengaruh ppp membuat sya telat mens.. Atau sya hamil ya cik soalnya blm sya tespek.. Mohon masukannya cik.. Karna sya baru pakai produk young living.